A beautiful fall weekend to enjoy the Dundas Valley as the trees begin their annual transformation and the crickets create a background track, the sun bright and warm as light clouds drift by. Solidago canadensis forms a sea of gold in open meadows (below), seen from above the Sawmill Trail, east of the main entrance driveway. "Solidago," Latin for "to make whole" (for the commonly named Goldenrod's healing properties); Solidago describes the sense I get when in nature, a chance to breathe and take time to observe the way things interconnect, to remember that we depend on the health of the earth's ecology for our well-being. Then I sifted through the sounds of car doors slamming, and car wheels on gravel driveways, and thought about the long driveway from Governor's Road slicing through the rolling land and across little streams to get to the parking lot, and wondered if some of the people who drove knew that the Hamilton to Brantford Rail Trail brings you to the same spot? I've known people who live nearby but don't realize they can get to the conservation area without driving, so perhaps there are others missing out on the ride. 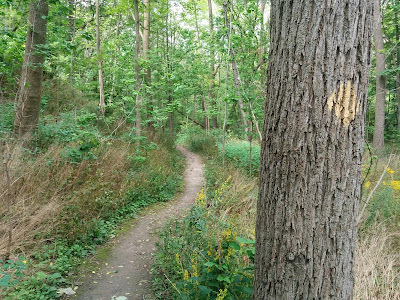 So if you are reading this, and live in West Hamilton or Dundas, the rail trail is an easy ride, off road of course, and takes you past all the trails in Dundas Valley. You can cruise right in to the Rail Centre and grab a muffin and a fair trade organic coffee, and forget about cars and roads for a while.